"The Little Things" wins big at 110th annual Sherman Prize Speaking Contest. Winner of 106th Eighth Grade Speaking Contest speaks out against stereotyping. These little moments are where the true personality is displayed. University School is proud to announce the winners of two venerable public speaking competitions: the 110th annual Sherman Prize Speaking Contest at the Hunting Valley Campus; and the Eighth Grade Speaking Contest, now in its 106th year, at the Shaker Campus. At the Sherman Prize Speaking Contest, junior Trevor Adams won first place for his speech entitled "The Little Things." 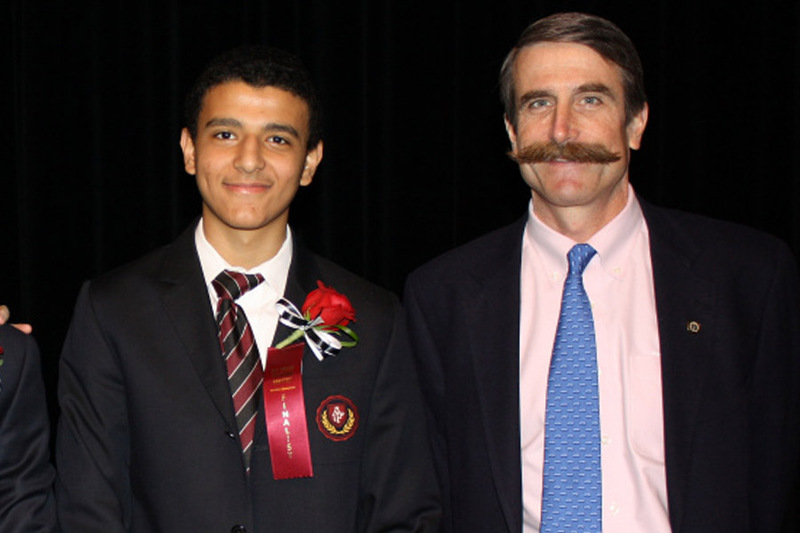 Eighth grader George Nageeb won first place at the Eighth Grade Speaking Contest for his speech "Stereotype Threats." In his winning speech for the Sherman Prize, Trevor discussed how people tend to forget the little things that matter most, and instead focus too much on bigger experiences and decisions. "These little moments are where the true personality is displayed," Trevor said. "Big decisions are made knowing that they will have an impact on one's life, while the finer, more personal moments only ascend to their true significance as people look back and reflect on their lives." 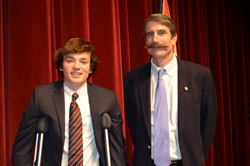 The second-place Sherman prize was awarded to junior Nicholas Hall for his speech "Life in the Middle." Sami Ascha, also a junior, received third place for "Passion Amidst Tragedy." Students who received honorable mentions were juniors Mason Monahan, Malik Mays, and Phillip Vorster. Mrs. Henry Sherman established The Sherman Prize Speaking Contest in 1904 in memory of her son, George Benedict Sherman, a member of the class of 1903. The speeches were judged on the basis of originality, clarity, organization, and quality of delivery. The judging panel consisted of: Richard Bryan '70, Head of School, Emeritus, The Nichols School; Lisa Farmer Cole, Executive Director of Transformation Schools for the Cleveland Metropolitan School District, and Margaret Mason, former Dean of Students at University School. In his winning speech -- "Stereotype Threats" -- at the Eighth Grade Speaking Contest, George Nageeb discussed the lasting psychological effects of racial, sexual and ethnic stereotypes on targeted individuals. George believes stereotypes are caused by fear of the unknown. To eliminate stereotyping, George suggests embracing diversity and restoring a person’s confidence and security. “Simple things like replacing jokes with compliments or encouragement can give kids the boost they need to look past the assumptions and work at their highest standard,” he said. Second place went to Benjamin Firstenberg for his speech, "It’s None of Our Business." Third place went to Isaiah Paik for "Brains Before Brawn." Honorable mentions went to eighth graders Miguel Martinez, R.J. McIntyre, and Joseph Fedro. The judges for the Eighth Grade Speaking Contest were: Alec Frankel, a US senior and 2010 Contest winner; Chris Quinn, vice president of Content for the Northeast Ohio Media Group; and William Daughtrey, US Dean of Student Life.